Flowers are edible! Well, not all flowers are, but fried squash blossoms definitely are. The best way to eat these flowers that come from squash plants, is to fry them up with some batter. I guess anything fried with batter is good, but seriously, squash blossoms rule for a couple of reasons. One, they taste like deep fried bananas and have a great sweet-savory balance to them. Secondly, they are outright just the coolest looking plant based ingredient ever! I’m such a sucker for unique and interesting ingredients too, so I’m stoked that these things are in season right now. If you’re searching for them, you should have some luck finding them at a local farmer’s market near you. Odds are they can be purchased fairly cheap and in bulk too! So, let’s start frying these bad boys up! My batter is pretty simple, consisting of cornstarch, flour, and a little baking powder. You’ll want to whisk all the dry ingredients in a mixing bowl and then add some really cold coconut soda! I actually just stumbled upon the coconut soda part, while searching for something with effervescence as effervescence will help to keep the batter light. I suppose you could also use beer for something like this too, but my Coco Rico was just chilling in my cabinet not doing much, until now! When you whisk the batter, it’s okay to leave some clumps, the key is to make sure the soda is cold. Next, we’ll give the squash blossoms a nice and even coat. I just dumped them all in the same bowl to save myself the dishwashing trouble. Once they are coated, you’ll want to drop them immediately into a pan with some oil. If you read my last post, you’ll know I’m a fan of shallow frying because it saves me from having to use a ton of oil. 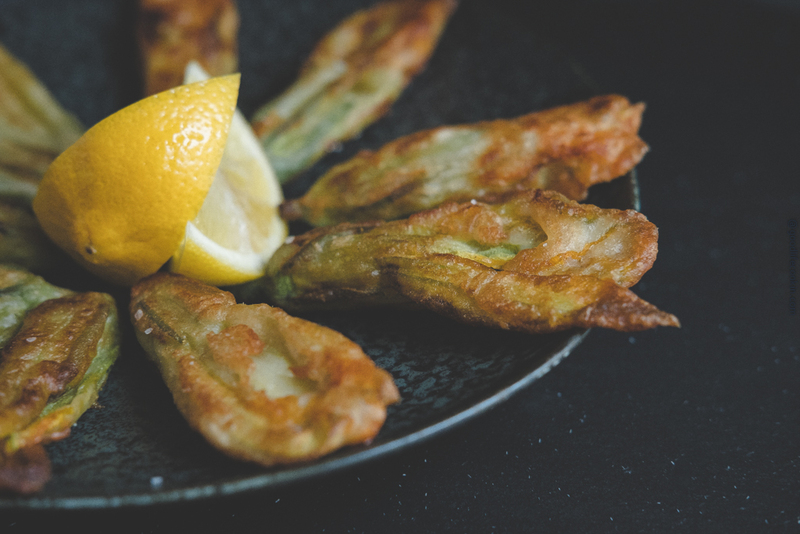 The problem with using this method for squash blossoms, is that they will kind of flatten out when you cook them this way…Still delicious nonetheless! These things will cook fairly fast, and all you’ll need is 2-3 minutes per side, then you’re done! To serve, just sprinkle a touch of sea salt on them and squeeze over some fresh lemon juice. This is such a great appetizer that everyone will love! Fried, savory-sweet, squash blossoms are the perfect edible flower for any appetizer you're looking to serve. Combine flour, corn starch, baking powder, and salt into a large mixing bowl and whisk. Add in coconut soda and mix until semi-smooth batter mix is made. Heat 1/3 cup of cooking oil in pan over medium heat. Add battered squash blossoms to pan and cook for 2-3 minutes on each side. Layout a paper towel on plate and set finished squash blossoms down. Sprinkle with salt and fresh squeeze lemon juice to serve.